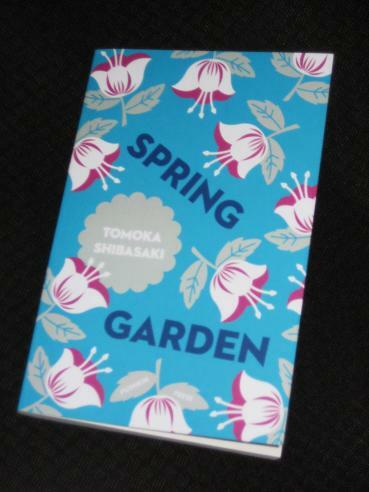 Tomoka Shibasaki’s Spring Garden (translated by Polly Barton, review copy courtesy of the publisher) is set in modern-day Tokyo, and revolves around the friendship between Taro, a divorced worker in his mid-thirties, and Nishi, a slightly older woman who draws Manga cartoons online. They both live in an ageing apartment building near the centre of the city, but it isn’t until Taro sees Nishi hanging around outside one of the few remaining houses in the neighbourhood that they actually strike up an acquaintance, gradually becoming good friends. Spring Garden may be a contemporary tale, but it certainly conforms to the Japanese literature tradition of favouring mood over plot, with little really happening over the course of the novel. It’s a book exploring the growing social relationships between a small group of people in a surprisingly quiet part of the urban jungle, looking at lives spent just outside the mainstream. There’s nothing thrilling here, just a few conversations, some chance encounters and a look at a city in constant flux, but there’s a certain charm to the way Shibasaki moves her characters around. Paradoxically, though, it’s very much a book about change. The apartment building where the main characters live is on borrowed time, with the son of the owner (whose mother is no longer capable of running her own affairs) wanting to have the place knocked down for redevelopment. Because of this, the place is slowly dying, with tenant after tenant disappearing without a word overnight, the building becoming ever quieter with each departure. The surrounding area is also changing, and every time Taro walks to the station, he sees signs of the area’s modernisation, scaffolding everywhere reminding him of the inevitability of progress. Taro was about to say that he wouldn’t feel the cold when he was dead, but it suddenly struck him that Numazu wasn’t actually wanting a conversation. He was just voicing the thoughts passing through his mind, and not looking for an answer. There were two other people in the office at that point, and they were without a doubt listening to what was being said, but neither of them uttered a word. These are superficial relationships, merely a useful way to pass time, and it’s easy to see that once they’ve served their use, they’ll be forgotten instantly. Spring Garden was an enjoyable read, yet it never really impressed me. There’s nothing terrible about it, but it certainly lacked a spark. When you’re half-way through a short novel, and you’re not really sure where it’s going (and you’re finding it hard to care), it’s never a good sign, and Shibasaki is guilty at times of being overly descriptive. A long section describing Nishi’s backstory takes up twenty of the hundred-and-fifty pages, a prime example of info dumping. It’s certainly not Barton’s fault that it’s a bit flat at times; there’s definitely a good story in there, and I suspect some restructuring would have made this work much better. I might give it a try… sounds like a book I’d enjoy. Jeff – I was a bit down on this one, but it’s not a bad book by any means.